In Scott Nichols' Principles of Engineering course at Pikesville High School in Maryland, students had a creative idea that could help people in developing countries receive better medical care. Through research, the students discovered that people who suffer trauma might not get the attention they need because of a lack of doctors. They realized that if they could create a three-dimensional template for a generic arm cast, they could alter the file based on an individual patient's arm measurements. With a small investment, developing countries' medical facilities could buy a 3D printer that would cost much less than having a doctor on staff — and they could print a customized cast based on the patient's measurements. Using a new 3D scanning and modeling tool from HP, called Sprout, the students used three-dimensional scans of their arms to create a model cast file that could be altered based on the measurements of a patient's arm and then sent to a 3D printer for creation. Sprout lets students grab and manipulate an object, then output it to a 3D printer. "Sprout allowed the students to bring their brainstormed ideas to life," Nichols said. "They were able to create 3D sketches of their ideas and use the touch mat feature to rotate and 'play' with their ideas. It was almost as real as having a tangible prototype." Sprout is just one example of how 3D technologies are becoming more immersive and interactive, bringing a whole new dimension to K-12 learning. Students can capture, rotate and examine 3D images to design an invention that could revolutionize health care in the developing world, understand the inner workings of the human heart, explore the inside of a volcano or take a virtual field trip to a faraway land. Being able to manipulate 3D images "changes our understanding of what things are," said Elliott Levine, chief academic officer for HP. "It gives students a greater understanding that the two-dimensional world [of images] fails to provide." Unveiled during the International Society for Technology in Education (ISTE) conference in Philadelphia in June, Sprout is an all-in-one computer and 3D scanner that enables students to grab an object from the physical world, manipulate it in the digital world and bring their new creation to life using a 3D printer (which is not included). With just a few taps, Sprout's 3D Capture app creates a high-resolution, full-color 3D digital model that students can manipulate any way they choose, the company said. Students place an object on the touch mat and tap the scan button, which activates the device's 3D cameras and sensors to capture a 3D color image of the object. 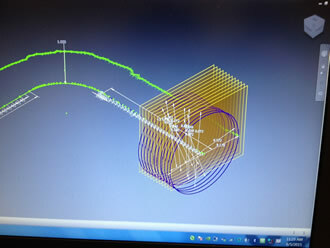 Then, they follow the instructions to rotate and capture their object from multiple angles and Sprout combines these images to build a fully editable 3D model. "Sprout is a fantastic tool for any STEM-centric classroom," Nichols said. "Throughout our Project Lead the Way course sequence, students focus on developing solutions to open-ended problems using the engineering design process. Essentially, the students identify a problem, brainstorm and sketch solutions to that problem, develop a tangible prototype, test the prototype and then use the feedback from the testing phase for future attempts. This machine allows students to experience a hands-on feel when developing solutions, without actually having to assemble a prototype." Sprout allows student to take a 3D image and stretch, rotate and manipulate it, which "substantially" aids in their understanding of how things work, Nichols said. "It allows students to explore their ideas in a 'real-life' setting without facing the difficulties of actually producing the prototypes," he said. Students are able to identify fundamental problems with their designs and avoid wasting time on developing non-working prototypes, leading to what he called several "ah-ha" moments. At Lee Mathson Middle School in East San Jose, CA, students are using another immersive 3D technology called zSpace to explore the inside of a volcano, peel apart the various layers of the Earth or examine a human heart as it's beating. "When we leave the zSpace lab, my students not only are more engaged, but they have a deeper understanding of abstract concepts," said teacher Victor Guendulain. "It makes a major difference in their learning." Students at Lee Mathson Middle School in East San Jose, CA use zSpace to manipulate virtual 3D images, making 3D learning more interactive. 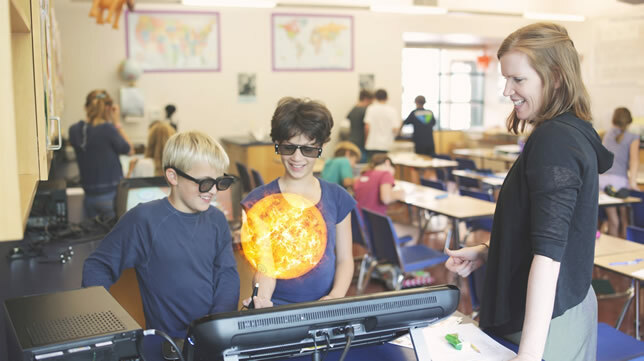 zSpace helps bring science education to life by allowing students to manipulate virtual 3D images, making 3D learning more interactive for students. The company isn't new, but at ISTE it introduced an all-in-one solution for schools.Previously, the zSpace system consisted of a virtual reality monitor and a separate computer. Using a special stylus, students can "pick up," rotate and otherwise manipulate the images they see on the 3D monitor — giving them a unique way to explore and interact with 3D content. The new self-contained version makes the technology available at a lower cost to schools, which typically purchase a zSpace lab in groups of 12 or 15 units. With two or three students at each virtual reality desktop, students collaborate in teams and use critical thinking skills to solve complex challenges. They can perform highly engaging tasks that are often impossible in the real world, like exploring a volcano or experimenting with zero gravity. Resource teacher Giselle Postrado said the technology engages students and puts the excitement back into learning. "They look forward to coming in and using the zSpace lab," she said. Google soon will be rolling out a new immersive 3D service of its own, called Expeditions, that could take virtual field trips to a whole new level — and the company is accepting requests from educators to pilot the technology in their classrooms this year. Using Google's Cardboard, a simple viewing device made out of folded cardboard, with an Android phone, students can experience a virtual excursion as an immersive, 3D event. Reminiscent of the old stereoscopic View-Master devices introduced by Mattel in the late 1930s, Google Cardboard turns a smart phone into a cutting-edge virtual-reality viewer that gives an added dimension to virtual field trips. "Expeditions allows teachers to make their curriculum come alive by taking their students on field trips to almost anywhere they can imagine," according to Google's education site. "Around the globe, on the surface of Mars, on a dive to coral reefs or back in time — abstract concepts come to life in Expeditions, giving students a deeper understanding of the world beyond the classroom." In a global pilot program announced at the end of September, Google will be sending teams to train participating teachers. These teachers then will be able to use the technology in their classrooms for the rest of the day. Google will use their feedback to improve the service before it formally launches. The images used to create the Expeditions are taken from photo spheres, or 360-degree views, within Google Maps and Street View. Dani Kennis, a grade 9 and 10 world history teacher at Clarkstown High School South in West Nyack, NY, was one of the first educators to try the technology in her classroom. Kennis traveled to New York in December 2014 to help Google programmers develop an Expedition. In May, she got to take her students on the Expedition she helped create.